Baguio, officially the City of Baguio (Ibaloi: Ciudad ne Bagiw; Ilocano: Siudad ti Baguio; Pangasinan: Siyudad na Baguio; Tagalog: Lungsod ng Baguio) and often referred to as Baguio City, is a highly urbanized city in northern Luzon of the Philippines, also referred to as the Summer Capital of the Philippines. It is geographically located within Benguet, serving as the provincial capital from 1901 to 1916, but has since been administered independently from the province following its conversion into a chartered city. The city has become the center of business, commerce, and education in northern Luzon, as well as the regional center of the Cordillera Administrative Region. According to the 2015 census, Baguio has a population of 345,366. Baguio was established as a hill station by the Americans in 1900 at the site of an Ibaloi village known as Kafagway. It was the United States' only hill station in Asia. The name of the city is derived from bagiw, the Ibaloi word for "moss". The city is situated at an altitude of approximately 1,500 meters (4,900 feet) in the Luzon tropical pine forests ecoregion conducive for the growth of mossy plants and orchids. During the Spanish rule in 1846, the Spaniards established a comandancia in the nearby town of La Trinidad, and organized Benguet into 31 rancherias, one of which was Kafagway, a wide grassy area where the present Burnham Park is situated. Most of the lands in Kafagway were owned by Ibaloys even prior to the appointment of Mateo Cariño as chieftain . The Spanish presidencia, which was located at Bagyiw at the vicinity of Guisad Valley was later moved to Cariño's house where the current City Hall stands. Bagyiw, a local term for "moss" once abundant in the area was converted by the Spaniards into Baguio, which served as the name of the rancheria. During the Philippine Revolution in July 1899, Filipino revolutionary forces under Pedro Paterno liberated La Trinidad from the Spaniards and took over the government, proclaiming Benguet as a province of the new Republic of the Philippines. Baguio was converted into a "town", with Mateo Cariño being the presidente (mayor). When the United States occupied the Philippines after the Spanish–American War, Baguio was selected to become the summer capital of the Philippine Islands. Governor-General William Taft on his first visit in 1901, noted the "air as bracing as Adirondacks or Murray Bay ... temperature this hottest month in the Philippines on my cottage porch at three in the afternoon sixty-eight." In 1903, Filipino, Japanese and Chinese workers were hired to build Kennon Road, the first road directly connecting Baguio with the lowlands of Pangasinan. Before this, the only road to Benguet was Naguilian Road, and it was largely a horse trail at higher elevations. The Camp John Hay was established on October 25, 1903 after President Theodore Roosevelt signed an executive order setting aside land in Benguet for a military reservation under the United States Army. It was named after Roosevelt's Secretary of State, John Milton Hay. The Mansion, built in 1908, served as the official residence of the American Governor-General during the summer to escape Manila's heat. The Mansion was designed by architect William E. Parsons which was based on preliminary plans by architect Daniel H. Burnham, the planner of the city of Baguio, designed the mountain retreat following the tenets of the City Beautiful Movement. In 1904 the rest of the city was planned out by the American architect Daniel Burnham, one of the earliest successful modern city planners. On September 1, 1909 Baguio was declared as a chartered city and the "Summer Capital of the Philippines". The period after saw further development of Baguio with the construction of Wright Park in honor of Governor-General Luke E. Wright, Burnham Park in honor of Burnham, Governor Pack Road, and Session Road. Prior to World War II, Baguio was the summer capital of the Commonwealth of the Philippines, and the home of the Philippine Military Academy. Following the Japanese invasion of the Philippines in 1941, the Japanese used Camp John Hay, an American installation in Baguio, as a military base. The nearby Philippine Constabulary base, Camp Holmes, was used as an internment camp for about 500 civilian enemy aliens, mostly Americans, between April 1942 and December 1944. On April 26, 1945, Filipino troops of the 1st, 2nd, 11th, 12th, 13th, 15th and 16th Infantry Division of the Philippine Commonwealth Army, 1st Infantry Regiment of the Philippine Constabulary and the USAFIP-NL 66th Infantry Regiment and the American troops of the 33rd and 37th Infantry Division of the United States Army entered Baguio and fought against the Japanese Imperial Army forces led by General Tomoyuki Yamashita which started the Battle for the Liberation of Baguio during World War II. By late March, Baguio was within range of the American and Filipino military artillery. President José P. Laurel of the Second Philippine Republic, a puppet state established on 1943, departed the city on March 22 and reaching Taiwan on March 30. The remainder of the Second Republic government, along with Japanese civilians, were ordered to evacuate Baguio on 30 March. Yamashita and his staff then relocated to Bambang, Nueva Vizcaya. A major offensive to capture Baguio did not occur until mid-April, when United States Army's 37th Infantry Division, minus the 145th Infantry Regiment, was released from garrisoning Manila to launch a two-division assault into Baguio from the west and south. Baguio is the site of the formal surrender of General Tomoyuki Yamashita and Vice Admiral Okochi at Camp John Hay's American Residence in the presence of lieutenant-generals Arthur Percival and Jonathan Wainwright. It is where they gave up the entire Imperial Japanese Armed Forces to American authorities at the High Commissioner's Residence (now the United States Ambassador's Residence) in Camp John Hay on September 3, 1945, marking the end of World War II. The 1990 Luzon earthquake (Ms = 7.8) destroyed much of the city of Baguio on July 16, 1990. A significant number of buildings and infrastructure were damaged, including the Hyatt Terraces Plaza, Nevada Hotel, Baguio Park Hotel, FRB Hotel and Baguio Hilltop Hotel; major highways were temporarily severed; and a number of houses were leveled or severely-shaken with a significant loss of life. Some of the fallen buildings were built on or near fault lines. Baguio was rebuilt with the aid from the national government and various international donors such as Japan, Singapore and other countries. After moving past the earthquake, Baguio then known as City of Pines was also able to attain theThe Summer Capital of the Philippines title. Baguio is located some 1,540 meters (5,050 feet) above sea level, nestled within the Cordillera Central mountain range in northern Luzon. 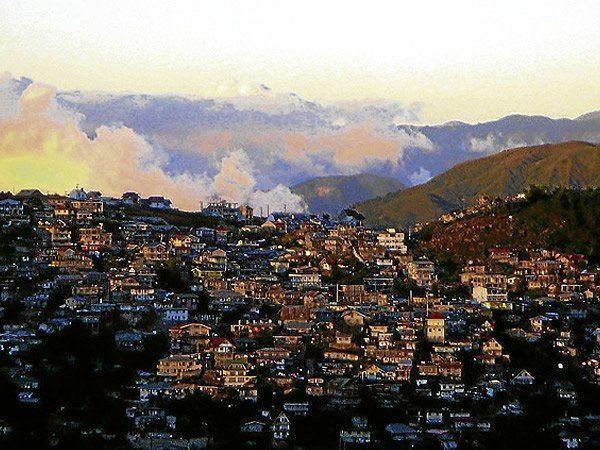 The city is enclosed by the province of Benguet. It covers a small area of 57.5 square kilometres (22.2 sq mi). Most of the developed part of the city is built on uneven, hilly terrain of the northern section. When Daniel Burnham draughted plans for the city, he made the City Hall a reference point where the city limits extend 8.2 kilometres (5.1 mi) from east to west and 7.2 kilometres (4.5 mi) from north to south. Under the Köppen climate classification, Baguio features a subtropical highland climate (Cwb) that closely borders a tropical monsoon climate (Am). The city is known for its mild climate owing to its high elevation. The temperature in the city is usually about 7-8 degrees Celsius lower than the temperature in the lowland area. Average temperature ranges from 15 to 23 °C (59 to 73 °F) with the lowest temperatures between November and February. The lowest recorded temperature was 6.3 °C (43.3 °F) on January 18, 1961 and in contrast, the all-time high of 30.4 °C (86.7 °F) was recorded on March 15, 1988 during the 1988 El Niño season. The temperature seldom exceeds 26 °C (79 °F) even during the warmest part of the year. Like many other cities with a subtropical highland climate, Baguio receives noticeably less precipitation during its dry season. However, the city has an extraordinary amount of precipitation during the rainy season with the months of July and August having, on average, more than 700 mm (28 in) of rain. The city averages over 3,100 mm (122 in) of precipitation annually. The city’s population as of May 2000 was placed at 250,000 persons. The city has a very young age structure as 65.5 percent of its total population is below thirty years old. Females comprise 51.3 percent of the population as against 48.7 percent for males. The household population comprises 98 percent of the total population or 245000 persons. With an average of 4.6 members per household, a total of 53,261 household are gleaned. During the peak of the annual tourist influx, particularly during the Lenten period, transients triple the population. The majority of Baguio's population are Roman Catholics. Other religious groups active in the city include the Pentecostal Missionary Church of Christ (4th Watch), Episcopal Church, Iglesia ni Cristo, Iglesia Filipina Independiente, Jehovah's Witnesses, United Church of Christ in the Philippines (UCCP), Jesus Is Lord Church (JIL), Jesus Miracle Crusade (JMC), the Church of Jesus Christ of Latter-Day Saints (LDS), the United Methodist Church, Assemblies of God (AG), and Baptist, Presbyterian, Lutheran, Members Church of God International (MCGI), Bible Fundamental, and other Evangelical churches. Baguio is the melting pot of different peoples and cultures in the Cordillera Administrative Region. Because of this, numerous investments and business opportunities are lured to the city. Baguio has a large retail industry, with shoppers coming to the city to take advantage of the diversity of competitively priced commercial products on sale. The city is also popular with bargain hunters—some of the most popular bargaining areas include Baguio Market and Maharlika Livelihood Center. Despite the city's relatively small size, it is home to numerous shopping centers and malls catering to increasing commercial and tourist activity in Baguio: these include SM City Baguio, Baguio Center Mall, Cooyeesan Hotel Plaza, Abanao Square, The Maharlika Livelihood Center, Porta Vaga Mall and Centerpoint Plaza. Various food and retail businesses run by local residents proliferate, forming a key part of Baguio's cultural landscape. Several retail outlets and dining outlets are situated along Bonifacio Street, Session Road, near Teacher's Camp, and Baguio Fastfood Center near the market. Another key source of income for Baguio is its position as the commercial hub for the province of Benguet. Many of the agricultural and mining goods produced in Benguet pass through Baguio for processing, sale or further distribution to the "lowlands." 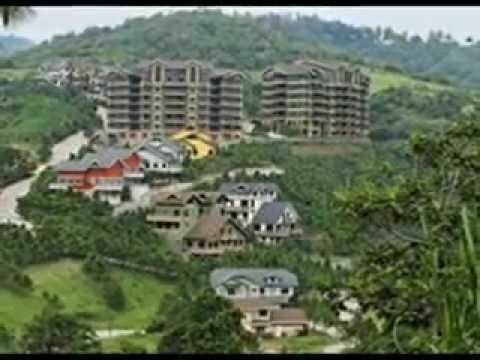 Baguio is one of the country's most profitable and best investment areas, a Philippine Economic Zone Authority (PEZA) accredited business and industrial park called the Baguio City Economic Zone (BCEZ). Located in the southern part of the city between Camp John Hay Country Club and Philippine Military Academy in Barangay Loakan. Firms located in the BCEZ mostly produce and export knitted clothing, transistors, small components for vehicles, electronics and computer parts. Notable firms include Texas Instruments Philippines, which happens to be the second largest exporter in the country, Other companies headquartered inside the economic zone are Moog Philippines, Inc., Linde Philippines, Inc., LTX Philippines Corporation, Baguio-Ayalaland Technohub, and Sitel Philippines, Baguio. Outsourcing also contributes to the city's economy and employment. There are many call centers present in the city. Teleperformance Baguio is headquartered in front of Sunshine Park. Other call centers in downtown are Optimum Transsource, Sterling Global and Global Translogic. While others like Convergys and IHG (InterContinental Hotels Group) have call centers in Camp John Hay away from the city proper. Tech-Synergy operates a large transcription and backoffice operation near Wright park. SitelThoughtFocus Technologies, a leading US provider of Software and KPO services decided to set up its KPO operation center in Baguio. 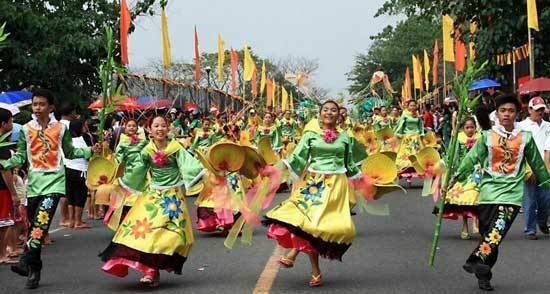 The languages commonly spoken in Baguio are Ibaloi, Kankana-ey and Ifugao, as well as Ilocano, Pangasinan and Kapampangan. Filipino and English are also understood by many inhabitants within and around the city. Several restaurants also serve different types of local and foreign cuisine. 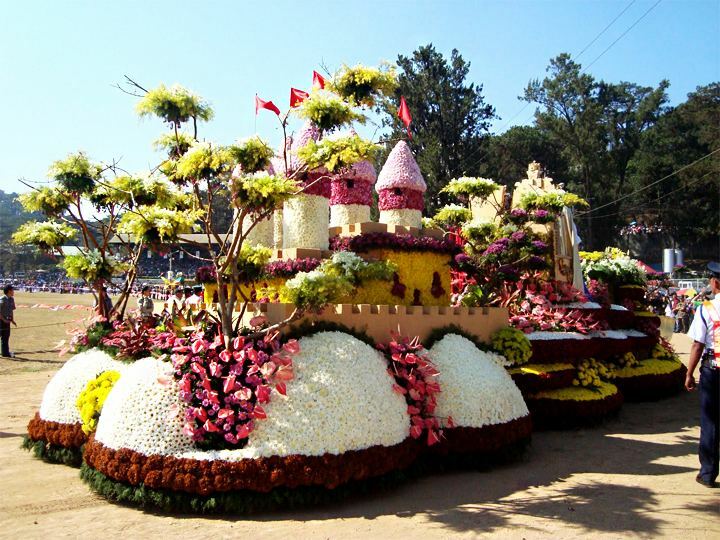 The Panagbenga Festival, the annual Flower Festival, is celebrated each February to showcase Baguio's rich cultural heritage, its appreciation of the environment, and inclination towards the arts. Aside from tourism, the festival also helped the younger generation of indigenous people to rediscover their culture's old traditions. The indigenous people were first wary with government-led tourism because of the threat that they will interfere or change their communities' rituals. The city became a haven for many Filipino artists in the 1970s-1990s. Drawn by the cool climate and low cost of living, artists such as Ben Cabrera (now a National Artist) and filmmaker Butch Perez relocated to the city. At the same time, locals such as mixed-media artist Santiago Bose and filmmaker Kidlat Tahimik were also establishing work in the city. Even today, artists like painters and sculptors from all over the country are drawn to the Baguio Arts Festival which is held annually. Like most Philippine cities, Baguio is governed by a mayor, vice mayor, and twelve (12) councilors. However, being a highly urbanized city with its own charter, it is not subject to the jurisdiction of Benguet province, of which it was formerly a part. The current mayor of Baguio is Mauricio Domogan, and the lone congressional district is currently represented by Congressman Mark Go. They were elected in May 2016. The three main access roads leading to Baguio from the lowlands are Kennon Road (formerly known as the Benguet Road), Aspiras–Palispis Highway (previously known as Marcos Highway) and Naguilian Road, also known as Quirino Highway. Kennon Road starts at Rosario, La Union and winds upwards through a narrow, steep valley. This is often the fastest route to Baguio but it is particularly perilous, with landslides during the rainy season and sharp dropoffs, some without guardrails. The Aspiras Highway, which starts in Agoo, La Union and connects to Palispis Highway, at the boundary of Benguet and La Union provinces, and Naguilian Road, which starts in Bauang, La Union, are both longer routes but are much safer than Kennon Road especially during rainy season, and are the preferred routes for coaches, buses and trucks. There are several bus lines linking Baguio with Manila and Central Luzon, and provinces such as Pangasinan, Nueva Ecija, Aurora, Cavite, La Union, and those in the Ilocos regions. Taxis and jeepneys are also common forms of transportation in the city. Baguio is a university town with 141,088 students out of the 301,926 population count done on the year 2007. It is the center of education in the entire North Luzon. There are eight major institutions of higher education in Baguio: the Saint Louis University, University of the Philippines Baguio, Philippine Military Academy, University of Baguio, University of the Cordilleras, Baguio Central University, Pines City Colleges, and Easter College. Teachers from all over the country enroll in summer education courses at Teachers' Camp.